For people named John McIntyre, see John McIntyre (disambiguation). John Herrick McIntire (June 27, 1907 – January 30, 1991) was an American character actor who appeared in 65 theatrical films and many more television series. McIntire is well known for having replaced Ward Bond, upon Bond's sudden death in November 1960, as the star of NBC's Wagon Train. He played Christopher Hale, the leader of the wagon train (and successor to Bond's character, Seth Adams) from early 1961 to the series' end in 1965. He also replaced Charles Bickford, upon Bickford's death in 1967, as ranch owner Clay Grainger (brother of Bickford's character) on NBC's The Virginian for four seasons. Tobacco Valley Cemetery, Eureka, Montana, U.S. The son of Byron Jean McIntire and Chastine Uretta Herrick McIntire, John McIntire was born in Spokane, Washington, and was of Irish descent. He grew up primarily in Montana around ranchers, an experience that later inspired his performances in dozens of film and television westerns. Later, he lived in Santa Monica, California. McIntire began acting in radio on Tarzan and the Diamond of Asher, where he met his future wife, Jeanette Nolan. McIntire played the title role in a Los Angeles radio station's production of The Adventures of Bill Lance and was the first actor to play the title role in the CBS radio drama Crime Doctor. :86 He played Jack Packard in I Love a Mystery:160 and Peter Carter in the radio version of The Lineup. :201-202 He worked on many episodes of Suspense from the early 1940s. He was the narrator for the radio programs Lincoln Highway,:201 and The March of Time. He was active in the theatre, before he embarked on a lengthy film and television career as a character actor. He was already 40 when he made his big-screen debut in 1947, but went on to appear in films, often portraying police chiefs, judges, eccentric loners or other western characters. His films included The Asphalt Jungle (1950), the 1960 Hitchcock thriller Psycho and the 1960 drama Elmer Gantry starring Burt Lancaster, but some of his more memorable roles were in westerns such as The Far Country (1955), with James Stewart, and The Tin Star (1957) with Henry Fonda. In Anthony Mann's Winchester '73, McIntire plays a shrewd card sharp and gun dealer. Though he technically played a supporting part, McIntire received top billing and his greatest critical acclaim for the fact-based crime movie The Phenix City Story (1955). He played a real-life reform politician who was assassinated by the Mob. In the mid-1950s, McIntire moved into television, appearing in anthology series, sitcoms and dramas. He guest-starred as Judson in the episode "Chinese Invasion" of NBC's one-season western series, Cimarron City, with George Montgomery and John Smith. 1962 cast with (clockwise) Scott Miller, McIntire, Terry Wilson and Frank McGrath. McIntire procured a regular role on ABC's Naked City,:740 before his character was killed off. McIntire was cast from January to May 1961 in the supporting role of Pa Canfield in the NBC American Civil War drama The Americans.:39. Though McIntire had never played the lead in a theatrical film, television provided him with his most prominent and long-running role when in 1961 he replaced the late Ward Bond in the NBC/ABC series Wagon Train, playing trailmaster Chris Hale:1147 in more than 150 episodes between 1961 and 1965. His co-stars were Robert Horton, Robert Fuller, Denny Scott Miller, Terry Wilson, Frank McGrath, and Michael Burns. 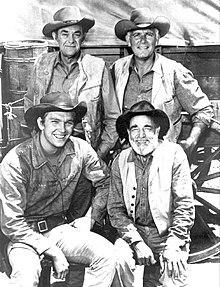 In 1960, McIntire guest-starred as William Palmer in the series finale, "The Most Dangerous Gentleman", of the short-lived NBC western Overland Trail, starring William Bendix and Doug McClure, his subsequent co-star on The Virginian. Also in 1960 John starred in a "The Twilight Zone" episode "The Chaser" where he played a mysterious purveyor of potions. In 1967, he guest-starred in an episode of CBS's short-lived western, Dundee and the Culhane. McIntire replaced actor Charles Bickford (who had himself replaced Lee J. Cobb) on NBC's The Virginian in 1967 when Bickford died. McIntire played Clay Grainger,:1143-1144 the brother of Bickford's character for four seasons, a major recurring leading role in a weekly 90-minute western series similar in size and scope to his earlier work on Wagon Train. He played the supporting role of Judge Parker in Rooster Cogburn (1975), the sequel to True Grit starring John Wayne and Katharine Hepburn, and appeared as Owen Keating in the 1977 television miniseries Aspen. His final film role was in Turner & Hooch (1989). In 1979-1980, McIntire played Ethan McHenry in Shirley on NBC,:962-963 and in 1981, he played Sam Whittier on the ABC drama The American Dream. On August 26, 1935, McIntire married actress Jeanette Nolan, and the couple had two children together, one of whom was the actor Tim McIntire (1944–1986). Their daughter Holly was also an actress, appearing in two episodes of Wagon Train. McIntire and Nolan both appeared in Psycho. He played a sheriff, while she voiced some of the "mother" lines. In the Wagon Train episode "The Janet Hale Story" McIntire and Nolan played husband and wife Chris and Janet Hale. In The Virginian, they also played husband and wife. They both appeared again as husband and wife in The Fugitive (1966) season 3, episode 24, as farm workers with their real life son, Tim. In the 1984 comic spy adventure Cloak & Dagger, they again played a couple. This time they portrayed sinister spies posing as harmless elderly tourists. McIntire and Nolan also worked together as voice actors. In a 1969 KCET television reading of Norman Corwin's 1938 radio play The Plot to Overthrow Christmas, McIntire played the Devil and Nolan played Lucrezia Borgia. In 1977 they appeared in the Disney animated film The Rescuers, in which he voiced the cat Rufus and she the muskrat Ellie Mae. Four years later, the couple worked on another Disney film, The Fox and the Hound, with McIntire as the voice of Mr. Digger, a badger, and Nolan as the voice of Widow Tweed. McIntire died on January 30, 1991 from emphysema and lung cancer in Pasadena in Los Angeles County. Aside from Nolan, he was also survived by their daughter, Holly McIntire-Wright and a grandson Luke Wright. McIntire and Nolan's son, actor/musician Tim McIntire, predeceased his parents, having died in 1986 from heart problems. ^ The book Television Western Players, 1960-1975: A Biographical Dictionary says of McIntire, "He studied at the University of California for two years before dropping out." ^ Obituary Variety, February 4, 1991. ^ a b c d e f Aaker, Everett (2017). Television Western Players, 1960-1975: A Biographical Dictionary. McFarland. p. 290. ISBN 9781476662503. Retrieved 28 April 2018. ^ a b c d e Terrace, Vincent (1999). Radio Programs, 1924-1984: A Catalog of More Than 1800 Shows. McFarland & Company, Inc. p. 9. ISBN 978-0-7864-4513-4. ^ "Cimarron City". ctva.biz. Retrieved September 8, 2012. ^ a b c d e f Terrace, Vincent (2011). Encyclopedia of Television Shows, 1925 through 2010 (2nd ed.). Jefferson, N.C.: McFarland & Company, Inc., Publishers. p. 36. ISBN 978-0-7864-6477-7.